Archiving Unrest critically reflects on democratic forms of unrest and assembly, while considering the influence that records and archives of these collective actions have on the ways in which we understand and value these events. The traces that remain of the massive strike wave that spread across Canada in 1919 fail to represent the radical change that was being called for by many. While the Winnipeg General Strike is arguably the most well remembered event from that period, it did not take place in isolation; it served as a catalyst for sympathy strikes from Victoria, British Columbia to Amherst, Nova Scotia—many of which also grew to become general strikes. Yet the records of these actions fail to speak to the collective desires of the participants, and the ordered structure of the archive can be at odds with the organic nature of this unrest. Through photo, video, and installation-based works, Archiving Unrest will seek to reflect on this form of collective action, while questioning the nature of collectivity itself. The works challenge the spectacle of much of the documentation of social and political unrest, shifting our focus from the charismatic speaker in the foreground to the crowds in the background. This is furthered by the participatory project Reading Groups, where each reading group session will discuss a text that considers group dynamics, collaborative practices and collective action, with the texts then added to a modular library structure within the gallery. 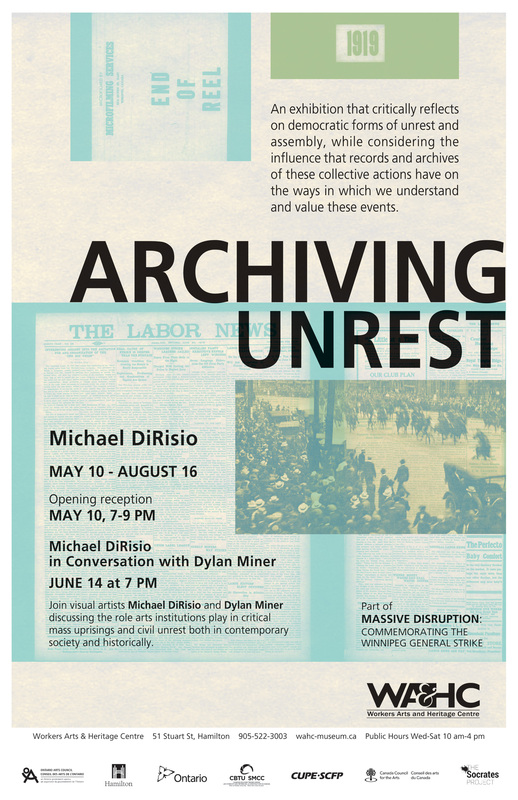 Join Michael DiRisio in conversation with artist Dylan Miner on June 14 at 7-9 pm. Archiving Unrest and Critical Dialogue are part of Massive Disruption: Commemorating the Winnipeg General Strike, which runs from May 1 to August 16. Michael DiRisio is a writer and visual artist based in Hamilton, Ontario. His recent work explores labour, social histories and the construction of value, through photo, video and installation-based projects. His writing has appeared in Art Papers, Afterimage, C Magazine, Espace Magazine, BlackFlash, and Public Journal, among others, where he reflects on art as a social force. He holds an MFA from the University of Windsor and has recently participated in residencies in Castellví de la Marca, Spain and Reykjavik, Iceland. His work has appeared in exhibitions at Museum London, Artcite, Eyelevel Gallery, and the Agnes Etherington Art Centre, among others, with a forthcoming collaborative exhibition with Teresa Carlesimo at Rodman Hall Art Centre. WAHC acknowledges the Canada Council for the Arts and the Socrates Project for its support of the Main Gallery exhibition program, as well as the Ontario Arts Council, the City of Hamilton and the Province of Ontario for its on-going support.